Funds are urgently needed to support our attorney's effort to stop the city's plans for a huge homeless shelter on the MTA Lot that will be just another magnet for homeless to come to Venice from all around the nation, yet will not solve the problem. Think of the St. Joseph walk-in center on Lincoln at Sunset, which is a plague to nearby residents - last year a homeless woman camping there started a fire in a dumpster behind St. Joseph and it jumped to the house next door and forced a family out of their home for weeks. That is what the city is putting in our residential neighborhood - on steroids - while the Neighborhood Council has identified better, existing facilities elsewhere that are not a threat to families. Working with residents living around the MTA lot, the VSA has already filed two legal briefs challenging the illegal environmental exemptions the City and Coastal Commission granted to the "Bridge Housing" project. With 154 homeless campers taking beds in temporary structures and at least 50 counseling staff, security and food service staff and custodial workers, the facility will have only 20 parking spaces. Despite an outdoor kennel for residents' dogs and an open-air dining area, all within 50 feet of residents' homes, there are no measures to control noise. And with the LAPD constantly short of officers, there will be no added security of any kind for the neighborhood and the beach walk streets. Since the city and Commission ignored our demands that the project receive a full environmental impact report addressing noise, parking, traffic, water quality (human waste from yet more encampments), and public safety, we are now raising funds to file lawsuits against the city and Commission and a writ for a preliminary injunction to stop the project from being installed until we have our day in court. Litigation is expensive. Fortunately many residents have already been very generous. We have now raised over half the funds needed to cover the lawsuit. If the shelter goes ahead, it could easily lower property values by hundreds of thousands of dollars, as new encampments mushroom on Main, Hampton, Pacific, Sunset, Paloma, Thornton and other nearby streets. It also will add a tremendous amount of noise and parking demand and traffic and bring even more drug addicted, mentally ill and criminal transients to the neighborhood. Please contribute $500 or more today. Tax deductible contributions may be made at Venicestakeholdersassociation.org. We face a deadline to file the suit, so your contribution is needed by January 1st. Please email Travis Binen at <travis.binen@delphix.com> for more information or venicestakeholders@ca.rr.com. After a long absence, the Venice Gondola is now back in Venice. Some time ago the Venice Historical Society had to pull the gondola off the Windward Circle due to the extensive damage it was suffering from vandalism. 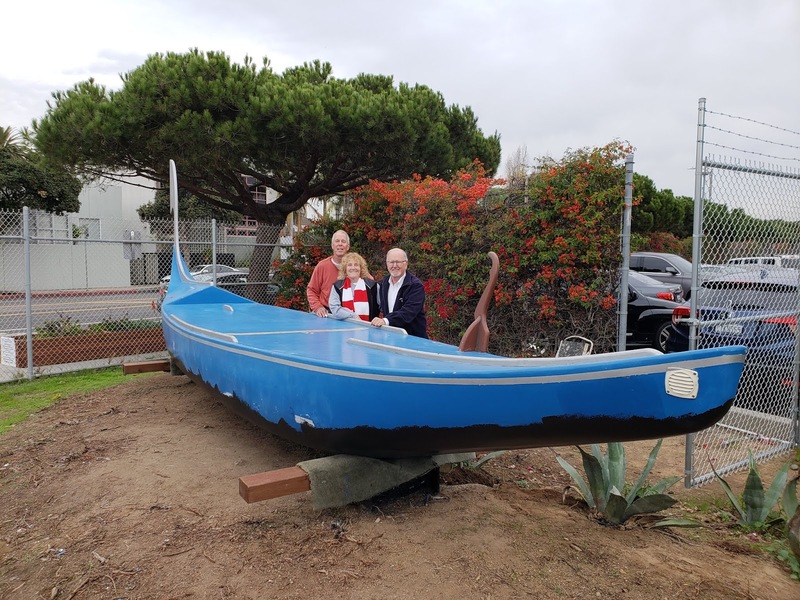 It had been sitting in storage near LAX until the beautification of the Venice Post Office environment by the VSA and Neighbors of Grand suggested a new home for the gondola. As part of beautification project, the VSA raised the funds to remove the over-grown foliage from the small garden at the west end of the Post Office parking lot and then welded steel plates atop the old I-beams that once held up a huge Safeway sign at that location. The steel plates provide a secure pedestal for the gondola. Then the VSA and Historical Society retained a fencing firm to install a wider gate from the parking lot to the garden to accommodate the gondola (seen below on the right). Stewart Oscars, who is restoring the gondola, Historical Society president Jill Prestup and VSA president Mark Ryavec. Critical to the project was the support of Post Mistress Brittani Cephas and the financial assistance of Hama Sushi owner Esther Chiang and resident Grant van Every. Today carpenter (and former VNC Board Member) Stewart Oscars finished the repairs and painting of the bottom and it was moved into an upright position. Next, Oscars will replicate and install several deck fixtures that were lost over the years and re-paint the remainder of the hull. Current plans are to re-paint the gondola in traditional black with gold trim. Other plans include landscaping and possibly Italianate fencing. Many thanks to all those who have supported this project. The Director of the California Coastal Commission has based his recommendation to grant the Bridge Housing project on the MTA bus lot a waiver from applying for a Coastal Development Permit and an environmental review on a completely bogus parking number. "The project includes the provision of 79 vehicle parking spaces and additional bicycle parking spaces to be provided on-site for approximately 15 service providers, which leaves ample parking for visitors to the site." 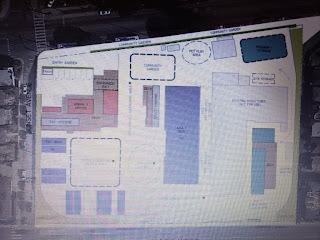 However, the site layout provided by Councilman Bonin's Office shows only nine (9) parking spaces, in the upper left corner of the plan. Both the city's Bureau of Engineering report on the project and Ainsworth's report fails to account for parking for security personnel, kennel staff, custodial staff, kitchen staff to prepare and serve 154 meals a day, and various teachers and instructors for the many programs the city intends to conduct at the facility. Of course, since the city cannot limit applicants to just those who do not own vehicles, it is likely that some residents of the Bridge Housing project will arrive with cars, trucks, SUVs, vans, campers and RVs, which will have to be parked in street parking spaces, taking these from beach visitors and residents alike. The Commission should proceed with a full environmental review of the project under a Coastal Development Permit application, focusing on the adequacy of parking, the impact of noise from the outdoor dining area, outside dog kennel and the numerous exterior HVAC systems on residents living less than 50 fifty away. A separate study of the historical contamination on the site is also required along with its potential to harm residents, staff and visitors to the site through accumulation of vapors in enclosed living quarters and offices. Residents may attend the Commission's hearing on Wednesday, December 12 in Newport Beach to protest the lack of a full environmental review. One must arrive before 9:00 am and submit a speakers request form to address the Commission. You may also write to: Jack Ainsworth <jainsworth@coastal.ca.gov> and Chuck Posner <cposner@coastal.ca.gov> and demand that the Commission require a full environmental review of the project. Whatever occurs with the temporary - and misguided - Bridge Housing proposal for the former MTA bus lot on Main Street at Sunset, the MTA will eventually collaborate on a joint development of the site with a for-profit developer; i.e., on a bricks-and-mortar housing complex. I encourage you to let your views be known to the MTA. This project will have a tremendous impact on the surrounding area, and will either fit in and complement the current housing patterns or be, as Prince Charles said of an overly large and modern development in London, a "carbuncle" on the face of Venice. I recently learned Councilman Bonin and homeless advocates are soliciting people outside of Venice to participate in the survey and ask that the future project be 100% permanent, supportive housing; i.e., populated entirely with people recently homeless. This is counter to the MTA guidelines which call for not more than one-third affordable units in these projects and which is counter to "best planning practices," which encourage a mix of market rate, work force and affordable units, only some of which would usually be permanent, supportive housing. 1. Comply with the height and density limits of the Venice Specific Plan, at least on the perimeter where the project faces existing two and three story residences. 2. Consider replicating the historic Venice Craftsman architecture, such as the two story apartment buildings on Horizon. 3. Do not close off the project from the surrounding area, but instead continue a walk street from Pacific to Main Street. 4. Comply with the parking requirements under the Venice Specific Plan and add additional parking for visitors and for residents, preferably in a subterranean, automated parking structure. 5. Include some artists lofts as part of the affordable units to re-establish Venice's art colony, and limit affordable units to one-third of the project. Of course, these are my preferences; let the MTA know yours. The survey closes this week, so do it as soon as possible. I am writing on behalf of many Venice residents to ask that you retain Patrol Commander James Roberts in Pacific Division. I have lived in Venice for over 30 years and been president of Venice Stakeholders Association for ten years. In all of my time working on public safety issues in Venice and Pacific Division I have never seen as dedicated, responsive, creative, effective and respectful a commander as Captain Roberts. He has worked tirelessly, and collaboratively, with residents and his Pacific Division team to address the unique public safety issues of our community. With only a year and a half on duty here, he has come up to speed quickly on the underlying circumstances we face: one of the largest visitor-serving destinations in the U.S. intersecting a highly problematic and service-resistant transient population, along with an open, illicit drug market and bicycle theft operations, combined with recent court decisions which severely limit the LAPD's enforcement options. Despite these challenges, he and his officers, along with Commander James Setzer, have made more progress in addressing crime and restoring safety for the public at Venice Beach and in the community, in a short period, than any other commander has accomplished since Jon Peters. Captain Roberts is now starting to implement several new initiatives, including returning to pairing social service workers with LAPD officers in a combined outreach to the large homeless population. He should be given the opportunity to follow-through on this and other plans to address our chronic crime, homelessness and safety issues. Please do not squander all the relationships and learning the good captain has acquired in his tenure here. Keep Captain Roberts on the job in Venice! As then-city councilman Eric Garcetti reminded me in a hearing many years ago, the squeaky wheel gets the grease. We have the attention of the new Chief of Police, Michel Moore, and his command staff. Let's make some noise Thursday evening! 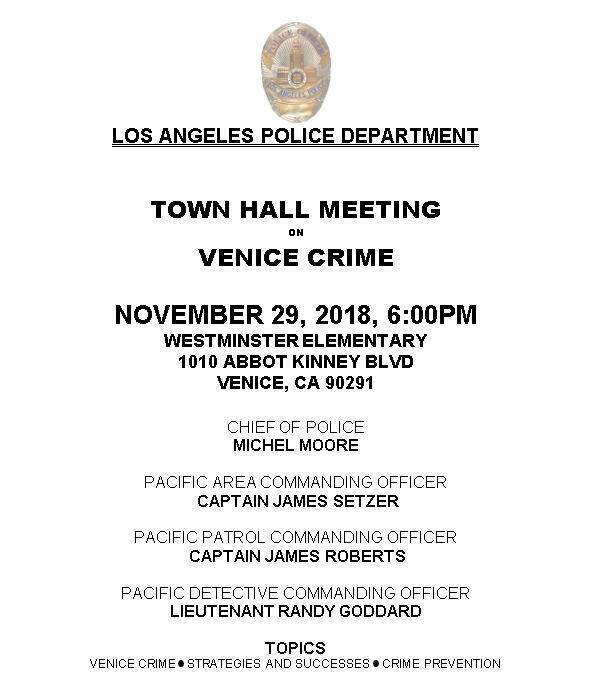 Reminder to everyone, Tuesday evening's Neighborhood Council Meeting is very important for the future of Venice. 1. Support the Land Use and Planning Committee's Motion for the City to conduct a proper feasibility study of the several city properties that could be used for Bridge Housing, examining factors such as time to permit, number of people that can be housed at the site, risk/burden to nearby residents and school age children, availability of entry-level jobs, etc. Our assessment is that by those objective standards there are several other sites, other than the MTA bus lot, which are far superior and place less burden on residents and offer more opportunities to the homeless, such as jobs. 2. Oppose the Venice Community Housing Corp's massive apartment and corporate office complex across from Whole Foods. It violates the height limit of the Venice Specific Plan, provides almost no parking, and would be the highest building in all of Oakwood, setting a dangerous precedent for developers to use to support approval of more oversize buildings, starting Venice down the road to the massive over-development we have witnessed in Santa Monica for years. Please send the following message to members of the Venice Neighborhood Council <Board@VeniceNC.org> opposing Venice Community Housing Corp's proposal to build the first four-story building in the Oakwood neighborhood. 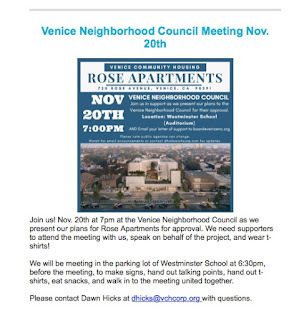 The VCHC is soliciting non-Venice residents to deluge the Board with emails. We need to fight back to protect Venice from over-development. The VCHC's proposal is too tall, too dense, has too little parking, and is way out of character with Venice. It is extremely out of step with both the Venice Specific Plan and the desires of residents for Venice to remain a low-rise community. Approving its 45-foot height and almost no parking will set a dangerous precedent. Send it back to the drawing board! I represent the Venice Stakeholders Association, a non-profit organization committed to civic improvement in the Venice neighborhood of Los Angeles. This is to follow up on our June 11, 2018, letter to you concerning the proposed construction of a temporary homeless shelter facility known as “Bridge Housing” at the 3-acre lot at 100 E. Sunset Ave. between Pacific Avenue and Main Street, which your office favors. We understand that in recent weeks, City officials, including the Mayor and the Chief of Police, have been citing to Martin v. Boise, a decision of the Ninth Circuit Court of Appeals, to support their efforts to site this shelter in Venice at this particular site. This case does not support their position. As you know, both public safety and quality of life are jeopardized by the presence of approximately 1,000 homeless persons on the streets, sidewalks, alleys and parks of Venice. Although VSA does not categorically oppose homeless shelters, either “temporary” or permanent, they are also not a fail-safe solution to the homeless crisis. Indeed, even the Mayor has said that his Bridge Housing program is an experiment. Accordingly, shelters should be sited with extreme caution, and not near residences and schools. VSA believes the primary cause of the burden now faced by residents in the many areas where homeless persons congregate is the City’s failure to enforce its own ordinances, and especially Los Angeles Municipal Code section 41.18(d), which prohibits sitting, lying and sleeping in public streets, sidewalks and public ways. By not enforcing this ordinance 24 hours a day in and around residential areas, the City has encouraged a significant number of homeless persons and "travelers" to remain on the street despite the fact that numerous alternatives are available to them, including shelter beds, housing vouchers, permanent housing placements in facilities such as those operated by the Self-Help And Recovery Exchange (SHARE), and/or a bus ticket to relatives in their place of origin (so-called "family reunification"). This is especially true in Venice, where many transients are people who are simply camping out while traveling the country, and thus do not want housing. VSA favors a regime in which section 41.18(d) is enforced 24 hours a day, provided that before issuing a citation the police officer (or a social worker) makes a credible, documented offer to the violator of housing in some form and transportation to reach the housing. Such an offer can easily be made by Los Angeles Police Department officers patrolling in Venice, as it was for several years by the Venice LAPD Homeless Task Force headed by Chaplains Steve and Regina Weller. There are several non-profit homeless service providers operating within the City of Los Angeles which have beds available on a daily basis. As just one example, SHARE, Inc. operates several facilities which generally have available beds. The necessary transportation to these shelter beds could be provided either by LAPD, the Los Angeles Homeless Services Authority (LAHSA), or any one of the many non-profit homeless service providers operating in Los Angeles. Some proponents of the Venice MTA site, including the Mayor and Chief of Police, appear to believe that the offer of housing, and transportation to it, are not sufficient to protect the rights of those who violate section 41.18(d). They argue instead that in order for the police to cite a violator of section 41.18(d), a shelter with available beds must be located in close proximity to the violator. The implication of this argument is that homeless shelters must be built close to every concentration of homeless persons in the entire City, which is of course untenable for financial and many other reasons. 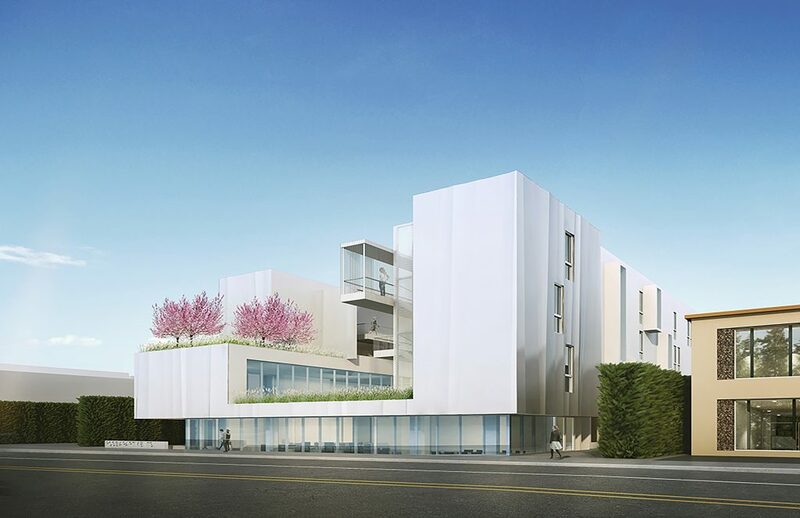 In Venice, this siting philosophy has resulted in the misguided proposal to place a 154-bed shelter two blocks from the beach, on the site of a former bus maintenance yard that is surrounded on four sides by residences and is within a block and a half from an elementary school and four pre-schools. The Jones Settlement did not require that shelter beds be available within a particular distance from the violator, in order to justify enforcement of section 41.18(d), or that transportation be provided to such shelters. The settlement also did not require that shelter beds be constructed throughout the City in order to enforce section 41.18(d); it merely required the construction of 1250 units of housing in the entire City of Los Angeles, which consists of 512 square miles, with half (or 625 units) within “greater downtown Los Angeles” and the rest anywhere else in the City. Whatever it may provide, the Jones Settlement no longer binds the City, as Mayor Garcetti acknowledged earlier this year, because the City has long since constructed 1,250 units of permanent supportive housing, with at least 50 percent of the units in downtown Los Angeles. Nonetheless, the City continues to behave as though the Jones Settlement were in effect. Attorneys for the Jones plaintiffs have threatened to resume litigation against the City if section 41.18(d) is enforced at night, on the ground that the homeless problem has worsened substantially since 2007, and many more units of housing are necessary to satisfy the demand. The City has given in to these threats, and continues to refrain from enforcing section 41.18(d) at night across the City. There is just one small ray of hope for a few residents of the City: Chief Moore has recently indicated that the city will return to selective enforcement of section 41.18(d) 24 hours a day near new Bridge Housing facilities, on the ground that the existence of Bridge Housing would be legally sufficient to justify enforcement in the immediate vicinity. In their argument for enforcement only near Bridge Housing facilities, Chief Moore, Mayor Garcetti and other Bridge Housing proponents have cited to a recent decision by the Ninth Circuit Court of Appeals in Martin v. Boise (Case No. No. 15-35845). However, that case holds, at most, that shelter beds must be available somewhere in the City before an ordinance like section 41.18(d) can be enforced. In Martin, the City of Boise had a program in which the three homeless shelters in the city each self-reported to the city whether they were full each day. If they weren’t, the police were free to issue citations to people sleeping on public property. A group of homeless persons sued the city, contending that even though one of the shelters had routinely reported that it had free beds, in fact these beds were not available to some offenders, either because of restrictions on length of stay, limited check-in times, or a requirement to participate in religious programs. Under these circumstances, the court noted that there was evidence that despite the self-reporting of the shelters, shelter beds were not actually available to violators. On that basis the court denied the city’s request to dismiss the case and allowed it to proceed. The City of Boise is approximately 9 miles by 9 miles in size, making up over 82 square miles. The average low temperature in December and January is 23 degrees. Yet the Martin court said nothing about the distance between the homeless persons to be cited and the available shelter beds; much less did it set any minimum requirement for that distance. Nor did the court even imply that the city was obligated to offer an actual shelter bed to a violator, or to transport the violator to a shelter, as a precondition of issuing a citation. Instead, the court merely found that in order to cite an offender, a shelter bed must be available somewhere in the city. In sum, the City of Los Angeles is basing its Bridge Housing siting practices upon a myth – namely, that the Jones Settlement, and/or the Martin decision, requires that shelter beds must be in close proximity to the violator in order to allow enforcement of section 41.18(d). In fact, there is nothing in the Jones Settlement or the Martin decision that precludes the City from pursuing the model favored by VSA, in which police officers themselves (or social workers working in tandem with them) make credible, documented offers of housing and transportation, and then, when such offers are rejected, proceed to enforce section 41.18(d). We request that you ask the City Attorney, the Mayor, the Chief of Police, and your fellow City Council members to carefully re-examine the Martin decision, and then seriously consider VSA’s proposal to recommence enforcement of LAMC section 41.18(d) in and around residential areas of the city at night. Thank you for considering my client’s views on this important subject. We have just learned that – true to form – Garcetti and Bonin have “closed” registration for the October 17 “Town Hall” regarding the massive homeless shelter on the MTA Lot, meaning that many Venice residents will be confined to an outdoor overflow space even as activists from other areas are admitted. Fight Back, Venice has prepared an easy way to protest these dirty tricks. Click on this link and send an email telling Mayor Garcetti and Councilman Bonin to let Venice speak! And show up early, best by 5:00 p.m., to get a seat. Please attend the Town Hall sponsored by the Mayor and Councilman Bonin on October 17th, 6-8PM, at Westminster Elementary School to oppose the proposal to put a shelter for 100 transients at this location in the midst of a residential neighbor, near three preschools and the elementary school. Venice already carries way more than its fair share compared to every other community in the 11th Council District. Here's a super video about the proposal and how it compares to other sites under consideration for Bridge Housing, which are all removed from residential areas. My congratulations to Paul Abascal, the producer, on such a professional production. Friends, we need 100 original signatures to force the VNC to put on their agenda a resolution calling on the city to enforce the law and stop camping on Venice Beach. The Resolution is below. Print it out and get as many signatures as you can and then drop it off to 1615 Andalusia Avenue. We have until this Friday to submit the signatures to the Administrative Committee to get this on the VNC agenda in October. Otherwise, we will slide until November. All Stored Personal Property remaining in any Beach Park after closing may be removed by the City. Personal Property placed in a Beach Park shall be deemed to be Stored Personal Property if it has not been removed from the Beach Park prior to the daily closure of the Beach Park. Moving Personal Property to another location in the same Beach Park or another Beach Park or any other Public Area as defined in Los Angeles Municipal Code Section 56.11, shall not be considered removing the Personal Property from the Beach Park. The City may remove and discard any non-permitted Bulky Item from a Beach Park without prior notice. In the event Personal Property placed in a Beach Park poses an immediate threat to the health or safety of the public, the City may remove and discard it without prior notice. Therefore be it resolved, the Venice Neighborhood Council calls upon the City of Los Angeles to immediately and continually stop all camping in the Venice Beach Recreation Area (VBRA) pursuant to LAMC 63.44, to remove all tents throughout the day and night, prohibit all items that exceed the size limits of LAMC 63.44 from entering the VBRA at any time, and to remove all personal possessions upon park closure every night. Please send the following message to city planner Oliver Netburn (oliver.netburn@lacity.org) opposing Venice Community Housing Corporation's proposal to build the first four story building in the Oakwood neighborhood. Dear Mr. Netburn, the VCHC's proposal is too tall, too dense, has too little parking, and is way out of character with Venice. It is extremely out of step with both the Venice Specific (land-use) Plan and the desires of residents for Venice to remain a low-rise community. Approving its 45-foot height and almost no parking will set a dangerous precedent. Send it back to the drawing board! The hearing is Wednesday at 9:30 AM, so please email your message by the end of business Tuesday. Thanks for helping stop this classic example of over-development. 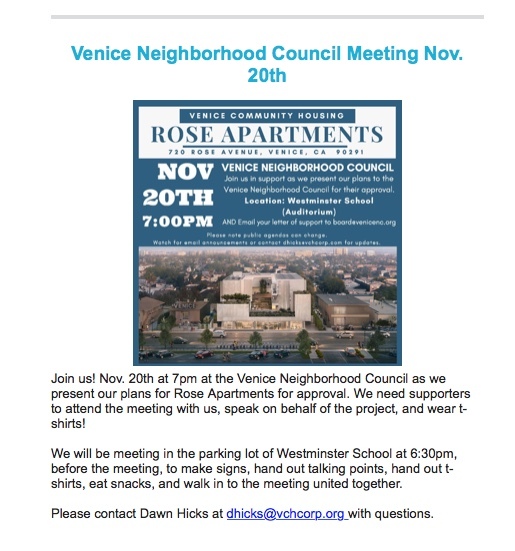 I am writing on behalf of the Venice Stakeholders Association to oppose the Rose Apartments project proposed for the former site of the offices of Venice Community Housing Corporation (VCHC) unless the project’s height, setbacks, façade, landscaping and parking are modified. As is readily evident from elevations of the project presented on VCHC’s website, the project will tower over all nearby structures. Further, the massing, height and lack of required parking stand in extreme violation of the Venice Local Coastal Specific Plan. Demolition of commercial office uses and the construction, use maintenance of a four-story, 35 unit permanent supportive housing complex with ancillary administrative office. This is a mixed-use project with ground floor commercial offices to be occupied by Venice Community Housing Corp., a private corporation, with a 35% plus 20% density bonus project totaling 35 residential units. The commercial component is not ancillary to the residential housing because VCH intends on conducting their own separate corporate business - which is now conducted in a structure on the same site – within the new structure - unrelated to the housing component. Outlined below are several facts which call for the modification of the project to conform with the VLCSP, city ordinances, Coastal Commission precedents, environmental best practices, and a variety of community concerns. 1. Number of stories and height of the building: The applicant has not designed the project within the California state standard density bonus guidelines but has requested “off menu incentives.” Off menu incentives are requests that exceed the “by right” incentives permitted under the density bonus laws. As an example, the SB 1818 state density law permits an applicant to exceed the height limit by one story and not more than 11 feet. This applicant is requesting two additional stories and 20 additional feet of height. As proposed this building would be the only four-story building in the entire Oakwood subarea of the Venice Land Use Plan. The permitted height in the coastal zone for this project is 25-feet for a flat roof and the proposed project is 45 feet high. Thus, this project represents a dangerous precedent both for future developments under the existing Specific Plan and for the message its approval would send to city planners now engaged in drafting the Venice Local Coastal Plan and revising the Specific Plan. Venetians support the low-rise nature of our community and want it maintained. 2. Parking The required parking for this project under the VLCSP is 89 spaces. In the past the Coastal Commission has determined that state density bonus laws DO NOT override the California Coastal Act. Numerous affordable housing projects within the Coastal Zone have been required to provide one parking space per unit. The proposed project as designed and presented to the Venice Neighborhood Council provides only 12 parking spaces for the 35 residential units of which seven parking spaces are proposed off-site. Based on the Los Angeles Municipal Code section 12.26E5 and documentation from the property owner who owns the offsite parking lot located at 225 Lincoln Boulevard, these seven off-site parking spaces will not be available for the new project, as explained below. 3. Off-Site Parking Affidavit Parking affidavit 4123, which was recorded on October 11, 1973, was an agreement signed between a building tenant, Safeway No. 45, located at 225 Lincoln Boulevard, and The Children’s Center for Educational Therapy, located at 718-720-722 Rose Avenue. Parking affidavits are required to be signed by the legal owners of the real property of both properties and not tenants. Safeway No. 45 was not the legal property owner and had neither the authority, permission nor right to sign said agreement. Parking affidavit 4123 should be deemed null and void. Furthermore, per city policy, parking affidavit 4123 will no longer continue in effect once the existing structures on 718-720-722 Rose are demolished. The seven offsite parking spaces which VCHC has publicly claimed will be satisfied by the affidavit are non-existent. 4. Building Setback Requirements from Rose Avenue The Specific Plan, in the Oakwood subarea, requires “any portion of the roof that exceeds 25 feet be set back from the required front yard at least one foot in depth for every foot in height above 25 feet.” The proposed project does not comply with this step back requirement and proposes a 45-foot high wall with no windows facing Rose Ave at the 2nd, 3rd and 4th floors. The proposed design does not provide a varied and articulated facade with visual interest to pedestrians. The primary ground floor entrance to the residential entrance does not face the street and is accessed from a narrow side yard and a 14-foot passageway and is located more than 75 feet from the sidewalk. All of these design elements violate the Specific Plan, thus precluding the CPC’s granting of a Project Permit under the plan. Further, the ground floor office space, which is not a visitor serving use, is set two feet below the grade of the sidewalk, which is inconsistent with the Los Angeles Citywide Design Guidelines. 5. Environmental Categorical Exemption The applicant is unacceptably proposing no environmental review for the proposed project despite requesting a project with density almost double that permitted in the zone, the tallest building in Oakwood by an entire floor, inadequate parking, no loading zone, blank walls facing Rose Avenue, no required step backs from the street, all of the mass of the building facing the adjacent neighbors’ properties, and has not provided a detailed explanation of what services will be provided on-site to residents and in the ground-floor corporate office for nonresidents, which may generate vehicular traffic. Your department should call for a full environmental review. 6. The City of Los Angeles and California Coastal Commission have already set a precedent for mixed-use projects with a residential density bonus on Rose Avenue and this project is inconsistent with that precedent. Building Height: The 720 Rose project should be limited to three stories with a 33-foot high flat roof. Placing the residential portion of the project on top of the commercial portion does not give the applicant a right under the density bonus to a 40 foot height, just a 30 foot height. The applicant should be told to remove the corporate office space or remove one floor of residences. Landscaping: The 720 Rose project should be designed with landscaping in order to enhance visual quality. To preserve water, the side of the project facing the public street, Rose Avenue, should be landscaped with large canopy street trees and low water use plants, consistent with City requirements. d. ¼ guest parking space per unit - equaling 6 parking spaces - for a total of 40 spaces. The additional required parking should be provided below grade. Having managed 160 units of affordable housing in the San Fernando Valley for five years I know from experience that while homeless individuals usually move in without a vehicle, this does not remain the case in many instances. As they stabilize their situation, receive benefits and job training, and eventually obtain employment, one of their first purchases is a vehicle. There also is the likelihood that some of the eventual residents of the Rose Apartments will be former “car campers;” by definition they will arrive with a vehicle. We have seen this here in Venice before. During Councilman Bill Rosendahl’s tenure, one of the first vehicle dwellers that PATH moved into an apartment in a Breezes del Mar building on California Avenue at Electric Avenue parked his empty camper across the street from the building for months, taking two parking spaces away from residents. Thank you for your consideration of our views on this project.